What is Stock In The Channel Quote Tool? 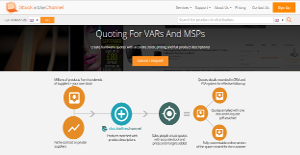 Stock In The Channel Quote Tool is a quoting application designed for Value-Added Resellers (VARs) and Managed Services Providers (MSPs) to help them create accurate quotes for their hardware complete with full stock and product descriptions and pricing. This powerful solution creates quotes in an instant, savings users significant time and effort that are required in a manual quoting process. With Stock In The Channel Quote Tool, users never have to search and scour the Internet or look at outdated resources to look for stock and prices. All the information needed are stored in a centralized location, making access to stock and pricing data fast and straightforward. Using the software is intuitive too even for novice users. Just add the product/s into the Stock Channel Basket, click “Quote”, and the application will generate the quote in minutes. Once done, the quotes can be easily downloaded as PDF and shared with their customers manually, through email, or via a custom link. Stock In The Channel Quote Tool provides Value-Added Resellers (VARs) and Managed Services Providers (MSPs) with a user-friendly, intuitive, and straightforward quoting application that makes quoting a faster, easier, and more productive process. Traditional quoting practices often involve looking through tens of websites or digging through resources that contain outdated data. Apart from being a time-intensive endeavor, manually scouring and gathering of stocks and prices often result to inaccurate and non-competitive product quotes. Stock In The Channel Quote Tool changes all that. With its easy-to-use quoting application, all you have to do is place your products inside the Stock In The Channel Quote Tool and hit that “Quote” button. The software does its magic and within minutes, you have quotes that are so precise and detailed that it seems a professional quote maker did all the heavy work. Every quote generated by this tool comes with complete details, including full product descriptions, images, and technical specifications. Stock In The Channel Quote Tool sources is information from 1.4 million products using a combination of Icecat product data and data provided by the distributors themselves. Prior to sharing your quotes with your clients, colleagues, and other parties, you can configure the quotes, make changes to the order of products, the quantity, cost and delivery price as you see fit. Once you’re satisfied, you can download your quotes as PDF and deliver them to your recipients manually or through email or provide them with a link to a branded site complete with your branding elements for a more custom look and feel. What Problems Will Stock In The Channel Quote Tool Solve? Stock In The Channel Quote Tool is ideal if you run with over 300,000 IT products and you want to automate the pricing process. No more manual quoting and price updating the site is impossible. Stock In The Channel Quote Tool helps you discover the best price of a product as well as a supplier when there are 12 suppliers of exactly the same item in the market. Intricate details such as rebates, agreements, trade policies, and more are included in the equation so you basically get the best. If you are considering Stock In The Channel Quote Tool it might also be sensible to check out other subcategories of Best Sales Proposal Automation Software listed in our base of B2B software reviews. It is essential to keep in mind that virtually no app in the Sales Proposal Automation Software category will be an ideal solution that can match all the requirements of all company types, sizes and industries. It may be a good idea to read a few Stock In The Channel Quote Tool reviews first as specific solutions can perform well exclusively in a very narrow set of applications or be created with a really specific industry in mind. Others may work with an idea of being simple and intuitive and consequently lack advanced functionalities welcomed by more experienced users. There are also software that support a wide group of customers and offer a rich feature set, but this frequently comes at a higher price of such a service. Make sure you're aware of your needs so that you choose a software that has all the elements you search for. How Much Does Stock In The Channel Quote Tool Cost? We realize that when you make a decision to buy Sales Proposal Automation Software it’s important not only to see how experts evaluate it in their reviews, but also to find out if the real people and companies that buy it are actually satisfied with the product. That’s why we’ve created our behavior-based Customer Satisfaction Algorithm™ that gathers customer reviews, comments and Stock In The Channel Quote Tool reviews across a wide range of social media sites. The data is then presented in an easy to digest form showing how many people had positive and negative experience with Stock In The Channel Quote Tool. With that information at hand you should be equipped to make an informed buying decision that you won’t regret. What are Stock In The Channel Quote Tool pricing details? What integrations are available for Stock In The Channel Quote Tool? If you need more information about Stock In The Channel Quote Tool or you simply have a question let us know what you need and we’ll forward your request directly to the vendor.